From zero direction (and a mental breakdown) to booking her first paying client and launching her first online course. “Carla not only helped me find a clear direction for my business but she has been the support I’ve needed to really get out of my comfort zone and reach my highest potential. Since she’s been through the whole starting a blog from scratch herself she was able to give me really actionable advice and clear my path to success. "When I decided to take my fitness business online I knew I needed to find a mentor to help guide me in the right direction. I didn’t have the time to waste in figuring it out, I just needed the steps to take my vision and make it a reality. 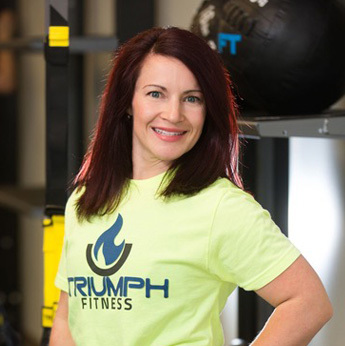 From the first time I spoke with Carla I knew she was the right fit for myself and Triumph Fitness. In a little less than a month Carla helped me launch a free online “Tighten Up Challenge” and my first signature online program which has since created more than $10.000 in revenue. More importantly through that online challenge, she believed in me and genuinely cared about my success, and I felt that through the daily follow ups. Carla has helped me not only get the courage to start an online program, but working with her over time, she's helping me tweak my signature program to keep improving it and thus getting more clientele. She's helping me grow my self confidence and through our coaching calls gives me the boost I need to continue my personal development, and positive mindset. I don’t think I can truly put into words exactly the boost she gave me to step out of my comfort zone, and get my fitness business into the online community where I am able to reach people I never thought I could. Thank you Carla for everything, and I cannot wait to see how much more Triumph Fitness will impact the world with your continued mentorship. Within 6 months of taking Instagram Secrets To Success, Jenny took her account @melrosefamily from 4k to over 9k followers and established her brand new account @jenny_melrose, and has quickly grown a highly engaged following - despite the algorithm changes. Instagram Secrets To Success made her understand the power of Instagram and how to use it as a business tool, leading to her most recent $35.000 launch. Carla's support means everything to me!" What I love about Carla is that she gives me very positive feedback. She looks at what I'm doing and gives me constructive criticism and direction without ripping apart everything that I'm doing. Having that support means everything to me." "Investing in 1:1 calls with Carla has without a doubt been the best investment I’ve made into my business." "New clients & Sold out in-person events and workshops." Carla is amazing at what she does. If you are looking to grow your Instagram account and increase engagement, I'd highly recommend her. She is a joy to work with and I have already personally recommended her to many of my friends and contacts who want to grow their accounts. Since working 1:1 with Carla I have used my Instagram as a way to book new clients and sell out in-person events and workshops. "Working with Carla simplified the 'scary' process of content creation"
Before working with Carla I was full of ideas and lacking execution - I had zero presence on social media or with online course creation. Carla not only helped me focus on my target audience, but she also helped me simplify HOW to effectively communicate with my community. Carla helped me create an online course specific to my niche which generated over $1.000 within 3 days of launching it! Creating this course was only made possible because of the exercises that she developed which helped me fine-tune my niche and critically think. Carla is a marketing guru - her clear strategies and attention to detail coupled with her individualized support helped me grow and engage my ideal customer. Carla is my go-to in the world of online marketing. "Carla goes above and beyond and I'm looking forward to working with her again!" - Toni Marinucci (Tips With Toni @tipswithtoni). Toni's biggest struggle was building her email list and all the technological struggles around that. She didn't have a lead magnet or a way of capturing email addresses before we started working together. She now feels confident and excited about growing her list through her new health quiz and about using email marketing as a tool to get more paying clients. "Carla has been enormously helpful to BloomAgainBklyn"
Carla has been enormously helpful to BloomAgainBklyn by better focusing our social media efforts through clearer messaging and identification our key audiences. Thanks to Carla, we have seen our followers grow substantially and the traffic to our Instagram and websites increase dramatically. Thanks Carla!" "I am so thankful to have found Carla!" Her Instagram Secrets to Success online course as well as 15 Minutes 2 Social course has helped me to apply all her knowledge to start growing my following as well as a solid network. After I decided that social media was the right path for me to get my recipes and ideas out there I just jumped into the deep end and luckily for me Carla was there to guide me and give direction that would have taken me very long to try and figure out for myself. Her way of standing with people to help them succeed has really touched me very deeply and made my experience with trying to grow a brand on social media a great one. Her innovative way of teaching others as well her ability to stay on top of new trends and changes on social media has made her teachings a tool that everybody should use. Her courses are easy and user friendly and it is information you can apply immediately to see results. I am forever thankful to have found her and I am looking forward to all her future innovate courses that she will come up with. Thank you Carla. "Carla provided me with direction and strategies that play to my strengths and my business." Carla was able to quickly analyze my current situation and online presence and provided me with direction and strategies that play to my strengths and my business. She pointed out things I would have overlooked and helped me understand what areas to focus on to get the best results without wasting time on the "wrong" platforms. Online marketing can be overwhelming, but Carla helped me understand what strategies to focus on based on my specific goals and target market, and how to save time and streamline my workflow through automation. Just wanted to say THANK YOU to Carla, for her incredible insights! Our Instagram account hit 1k followers today! It's a small victory, but I know if any group will appreciate it, it is this one! I joined this group when we were around 200 followers and had the opportunity to sign up for Carla's one-on-one which then led to us meeting in person when she was in New York. I am continuously amazed by the personal attention she gives all of her clients - both paid and unpaid! Carla, you are a brilliant businesswoman with a generous spirit and I'm so thrilled to be working with you and a part of this community you're building. Excited for what's to come! "I recommend any health professional to seek out Carla's services for clarity, direction and support." I came to her with needing clarification about career next steps. I found that this was were Carla excelled. Carla is very knowledgeable in marketing strategisation, social media and goal setting. In our conversation, she helped me realize just how important goal setting is and then proceeded to assist me in that realm. She came up with several specific steps for me follow in order to accomplish set goals such as my recipe book, workshop, etc. She gave concise directives with clear guidelines. She also gave really informative feedback on websites to use, email list guidance, etc. Overall Carla has a very warm demeanor; she is extremely easy to talk to and likewise you can tell she is very willing to help in any way she can. I finally finished the last of the modules of Instagram Secrets To Success, and just wanted to say a big THANK YOU for developing such an awesome course! I find the tools and ideas to be very helpful moving forward and beginning to grow my brand online. Again, thank you for all that you do to help RDs build the foundation of our brands online! Keep up the awesome work. "Thank you, Carla, for your golden techniques!" Carla's experience, knowledge and tactics have been so useful and inspiring for the growth of my Instagram account. She gave me insight into creating a successful profile, tips for great hashtags and skills to gain real, authentic followers. Her course is the complete package, it will teach you so much and bring you big changes, almost overnight. Thank you Carla for your golden techniques, you've made my Instagram journey so much easier! "I am short of words to express how grateful I am for all your support!" I got great value from Carla's course Instagram Secrets To Success. Her feed back and strategies have helped me tremendously to increase the level of engagement and organic growth of my Instagram account. She has provided me with her continuous support with amazing and positive results! "thank you for all your advice and knowlede!" I had an hour conversation with Carla, which it was a gift from her that has kept giving because in that hour I acquired great information that I never found during my long hours of research about social media and how to start monetizing my passion. She gave me clear advice and actions to take that I have been applying since then. You can tell that she really cares about you and about helping you, and gives you concrete tools which you can implement right away. Thank you, Carla! "I learned so much in the few hours of working with you!" I started Simple Green Recipes as a small project to share my creativity on Instagram. After implementing the strategies provided by Carla, I went from 200 to 1000 followers in just 3 weeks. And my account keeps growing day by day. So glad I contacted Carla! Can’t wait for the day I built my own business out of doing what I love, with the help of Carla’s great advice and marketing strategies. "2 sold out Instagram Talks within 2 weeks!" We had the chance to welcome Carla in our Coworking space a few weeks ago and after discovering she was an Instagram expert, we decided to organise a series of talks and an intensive workshop. Carla offered our clients an utterly interesting and well-structured content on the best Instagram strategies. She is a great communicator and knows how to establish an interactive, dynamic and chilled debate among the attendees. She took the time to tailor her tips to our audience and they left enlightened and inspired. "by far the most personal, thorough and value-for-money workshop I've ever attended." Whether you come with an established business or as a brand new social media start-up, Carla will give you the tools necessary to pinpoint your core passion, draft up a work plan and get to growing your Instagram following. This is by far the most personal, thorough and value-for-money workshop I've ever attended. "Carla's Instagram workshop was invaluable!" If you're looking to improve your theme, your bio, your feed, your engagement, your follower base and more, this is the workshop for you. Carla is patient and provided an open forum to learn from both her and others and I would definitely participate in another IG workshop hosted by her!